Etiquette holds an esteemed place in Islam. Passing on etiquette as insignificant generally leads to the abandoning of deeds that are sunnah, which leads to the discarding of a wajib (compulsory) act and so on. 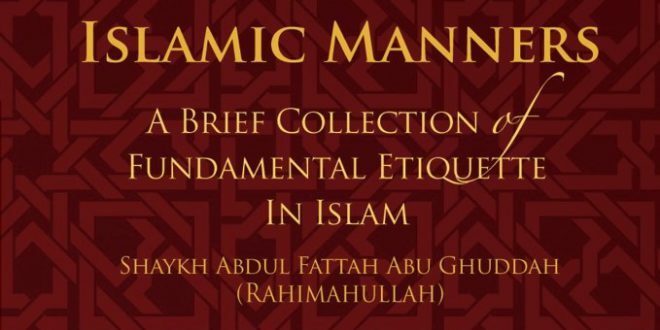 In this booklet, the honourable Shaykh ‘Abdul Fattah Abu Ghuddah (rahimahullah) has listed a few pertinent but often neglected Islamic manners. The manners of Islam are many and are therefore impossible to be encompassed in a brief booklet as this one. However, if the few that are mentioned in here are implemented, one could then endeavor to progress further insha Allah. Kitabu-Tahajjud of Al-Ishbili (rahimahullah) pg. 132.